Di Sabatino A1, Volta U2, Salvatore C1, Biancheri P1, Caio G2, De Giorgio R2, Di Stefano M1, Corazza GR3. There is debate over the existence of nonceliac gluten sensitivity (NCGS) -intestinal and extra-intestinal symptoms in response to ingestion of gluten-containing foods by people without celiac disease or wheat allergy. We performed a randomized, double-blind, placebo-controlled, cross-over trial to determine the effects of administration of low doses of gluten to subjects with suspected NCGS. We enrolled 61 adults without celiac disease or wheat allergy who believe ingestion of gluten-containing food to be the cause of their intestinal and extra-intestinal symptoms. Participants were randomly assigned to groups given either 4.375 g/day gluten or rice starch (placebo) for 1 week, each via gastro-soluble capsules. After a 1 week of gluten-free diet, participants crossed over to the other group. The primary outcome was the change in overall (intestinal and extra-intestinal) symptoms, determined by established scoring systems, between gluten and placebo intake. A secondary outcome was the change in individual symptom scores between gluten vs placebo. 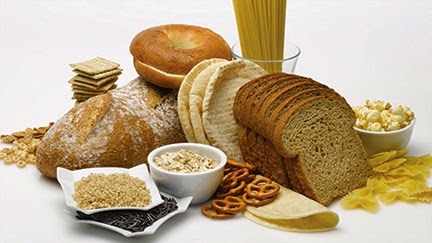 According to the per-protocol analysis of data from the 59 patients who completed the trial, intake of gluten significantly increased overall symptoms compared with placebo (P=.034). Abdominal bloating (P=.040) and pain (P=.047), among the intestinal symptoms, and foggy mind (P=.019), depression (P=.020), and aphthous stomatitis (P=.025), among the extra-intestinal symptoms, were significantly more severe when subjects received gluten than placebo. In a cross-over trial of subjects with suspected NCGS, the severity of overall symptoms increased significantly during 1 week of intake of small amounts of gluten, compared with placebo.